The photo of the tallit katan shown below, which was donated to the United States Holocaust Memorial Museum ten years ago, kept haunting me. I contacted Kyra Schuster, a curator at the Holocaust Museum, and she provided me a bit of information about Chaim Bornstein, the man who found the tallit katan in Poland in the spring of 1945. Bornstein was born in 1911 near Krakow, Poland and his family later moved to Druja. After the Jews of Druja were forced into a ghetto by the Nazis, 24-year-old Chaim, who was a skilled watchmaker, repaired watches for the SS. When the ghetto was liquidated in 1943, Schuster related, Chaim escaped to a nearby forest. A Polish family allowed him to stay in their barn for ten months, but as the risk of being discovered grew Chaim fled, eventually joining a group of Polish partisans, who he remained with until the war's end. After spending time in displaced persons camps, Chaim married and emigrated to the United States in 1948. In 1945 at the end of World War II, Chaim Bornstein recovered the tallit katan from a burned-out home in Druja, which was once part of Poland and is now in Belarus. He carried it with him during his time in displaced persons camps. What strikes me is that the tallit katan appears to have been made by cutting up a tallit gadol. 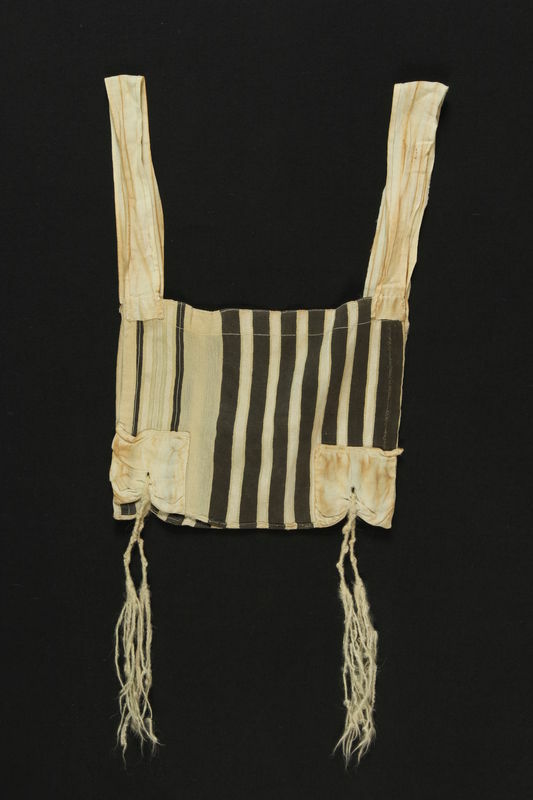 Could it be that the owner of the tallit no longer had any use for it, since he was no longer going to shul (and perhaps could not even pray at home much of the time), but he wanted to continue to keep the mitzvah of tzitzit? Or maybe his regular tallit katan had worn out, so he decided to improvise one from the materials he could scrape together.